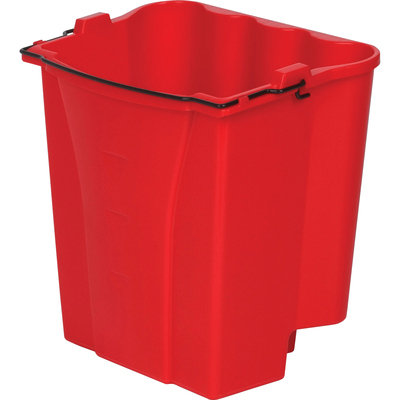 Dirty Water Bucket Is Designed For Use With Rubbermaid Wavebrake Combo. The Bucket Separates Dirty Water From Clean Water. Isolating Dirty Water Reduces Risk Of Cross-Contamination And Helps Produce Cleaner, Less Slippery Floors. The 18-Quart Bucket Divides Liquid Weight, Less Lifting Power Needed When Emptying Buckets.. Dirty Water Bucket Is Designed For Use With Rubbermaid Wavebrake Combo. The Bucket Separates Dirty Water From Clean Water. Isolating Dirty Water Reduces Risk Of Cross-Contamination And Helps Produce Cleaner, Less Slippery Floors. The 18-Quart Bucket Divides Liquid Weight, Less Lifting Power Needed When Emptying Buckets.